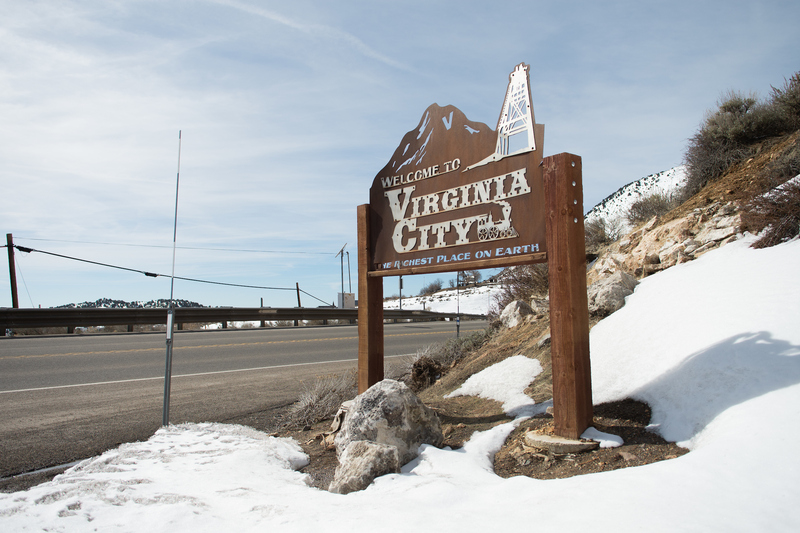 The story of Toll is a complicated tale fueled by the heated public feuds and factions that have existed in Virginia City since the discovery of the Comstock Lode (the credit for which is itself disputed). It is a story about the First Amendment and press freedom. But it is also a story of a rural sheriff and #MeToo. It is about the norms, in 2019, of where journalism ends and politics begin. 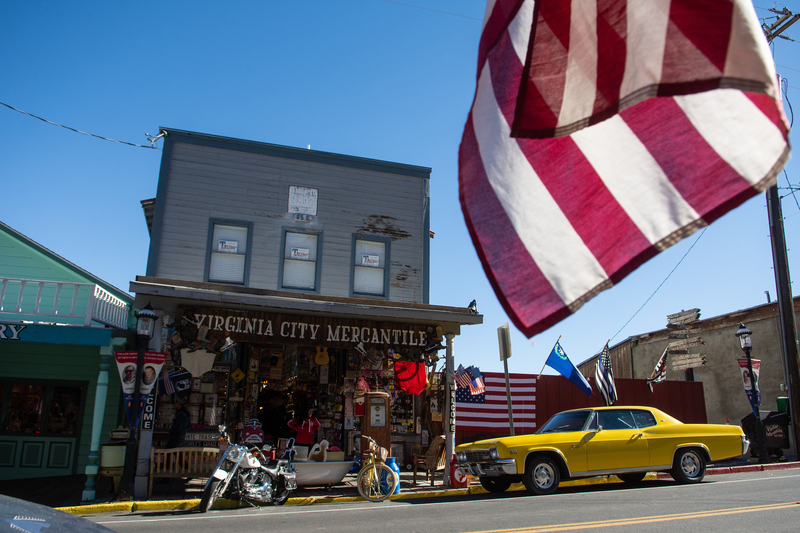 But it is also about a story questioning the residency of a county commissioner and a brothel owner credited for moving the region to a new bonanza near the Comstock: Big Tech. Earlier this year, the judge dismissed most of Gilman’s claims. Carson City Judge James Wilson noted that Toll’s often irreverent style — what case law calls “lusty and imaginative expressions of contempt” — did not amount to defamation in and of itself. (Toll once wrote satire imagining “Glance ‘The Thrill’ Thrillman” opening up a petting zoo at the brothel). But the judge sided with Gilman on one claim. Wilson said that articles challenging Gilman’s residence were potentially defamatory, and the judge allowed Gilman to conduct discovery to prove they were. 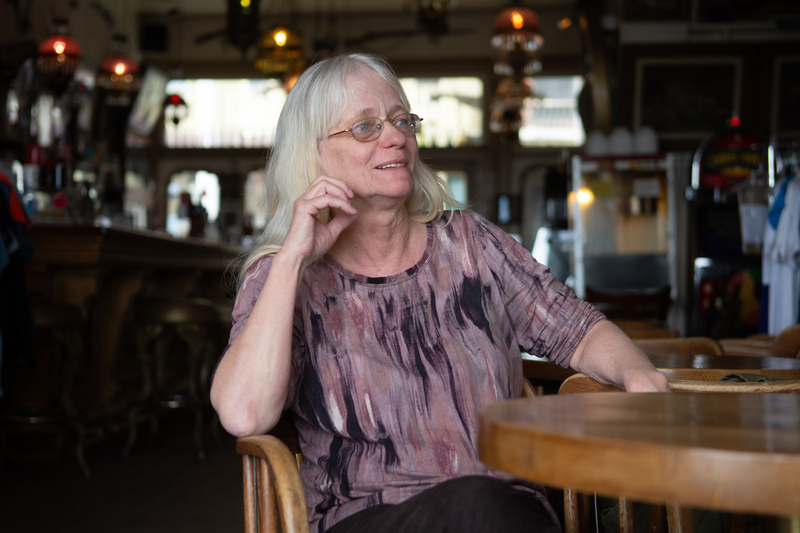 When Gilman wanted to find out the sources for Toll’s stories, Toll asserted Nevada’s shield law, which protects reporters from revealing who they received information from. The court was then forced to grapple with the question: Is Toll, the irreverent Gold Hill blogger, a news reporter? Toll said he hasn’t smoked weed in years. Born in 1962, he did smoke weed growing up. And it was around that time that weed and journalism converged in Reno to form the basis of Nevada’s shield law, the statute that the grenade-throwing blogger is now waving around as fortification. It started when a journalist named Warren Lerude, then the young editor of the Reno Evening Gazette, published a silhouetted photo of UNR students smoking pot. Then-Washoe County District Attorney Bill Raggio requested Lerude reveal the identities of the pictured students. When Lerude refused to reveal them, Raggio threatened him and his reporters with jail time. That new law protected journalists from revealing sensitive sources. Good journalists try to rely mostly on named sources because it bolsters credibility. But there are regularly situations in which important news can only be reported by using anonymous sources who might fear retaliation or might be prevented from speaking because they work for the government. Lerude said the law was intended to be broad — to apply to all who were doing newsgathering. Media experts, including Lerude, who won a Pulitzer Prize in 1977, said that Toll should be protected by the shield law because he researches the news and reports it. He might do that with more sniping than most journalists, but at the end of the day, they said he is a reporter because of how he gathers news and his relationship to the public. His style does not matter. File, who Toll selected as an expert witness in the case, said the shield law was meant to protect all reporters. Because the judge canceled a hearing on the issue, File never testified. Wilson, the Carson City judge, took a different approach. He said Toll was a reporter. But in a ruling last week, he took a narrow interpretation of the shield law. Wilson said it did not apply to online publishers who were not affiliated with a “newspaper” or a “press association.” If upheld, the ruling, media experts said, could weaken Nevada’s shield law, leaving questions about whether the tough statute applies to online publications, freelancers and documentarians. Media experts said this interpretation is off, noting that “press association” is an anachronism for wire services. They said the statute was intended to cover all journalists, not just those affiliated with an organization or who can afford to pay dues to the Nevada Press Association. Although it deviates from another District Court ruling, File said Wilson’s order could give journalists pause. As a practical matter for Toll, it created a contradictory situation. Even though the court ruled that he was practicing journalism with the Storey Teller, it also said he would only be protected when he was paying dues to the Nevada Press Association. Toll established the Storey Teller in February 2017. But he didn’t start paying dues to the press association until August that year. Because of the ruling, Toll could be required to reveal his sources for three articles published before August. Toll’s lawyer plans to file a writ petition with the Nevada Supreme Court to strike down the order. National press groups, Toll said, have reached out to him with offers to support his case. If they’re unsuccessful, Toll said he is ready to go to jail before revealing his sources. 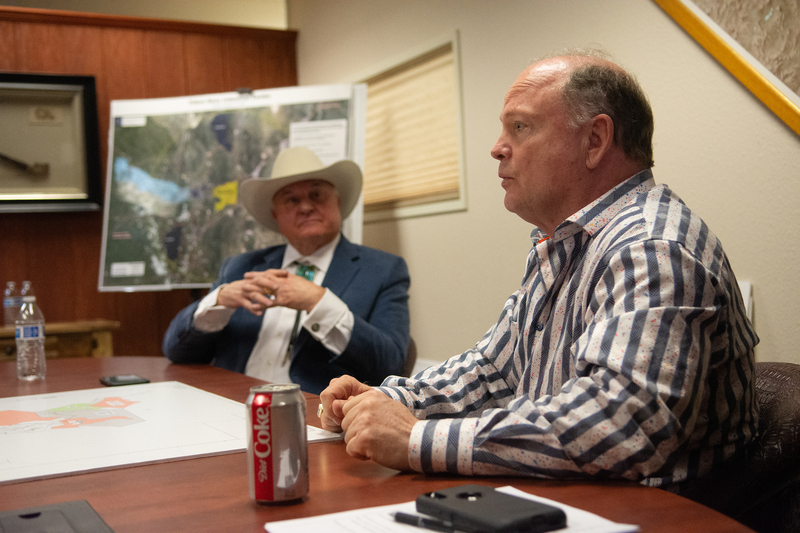 In a South Meadows conference room on the first floor of a nondescript building, Lance Gilman sinks into his chair, wearing a cowboy hat and a blue stone bolo tie in the shape of Nevada. He is sitting next to Kris Thompson, the project manager for the Tahoe Reno Industrial Center, the business park Gilman developed for high-tech companies like Tesla, Switch and Google. 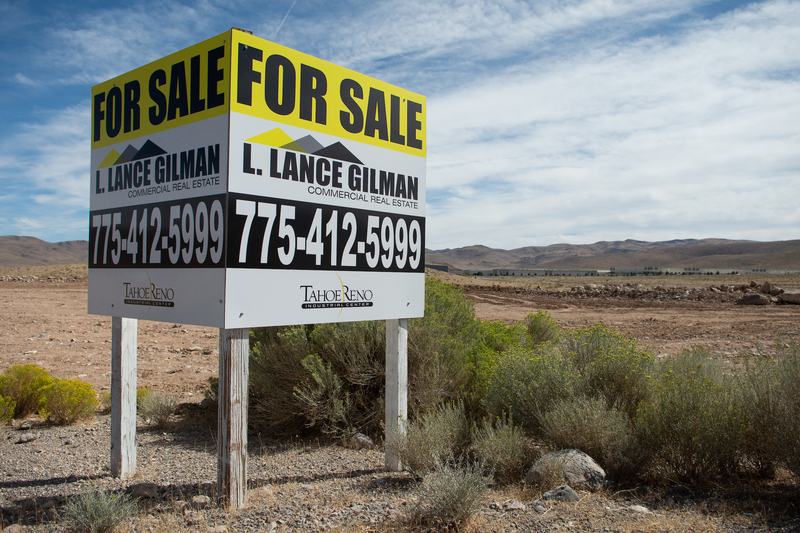 Gilman’s business, in addition to running the Mustang Ranch, is real estate. He sits in front of maps. On the wall and in cabinets, there are photos of politicians and commendations from the congressional delegation. 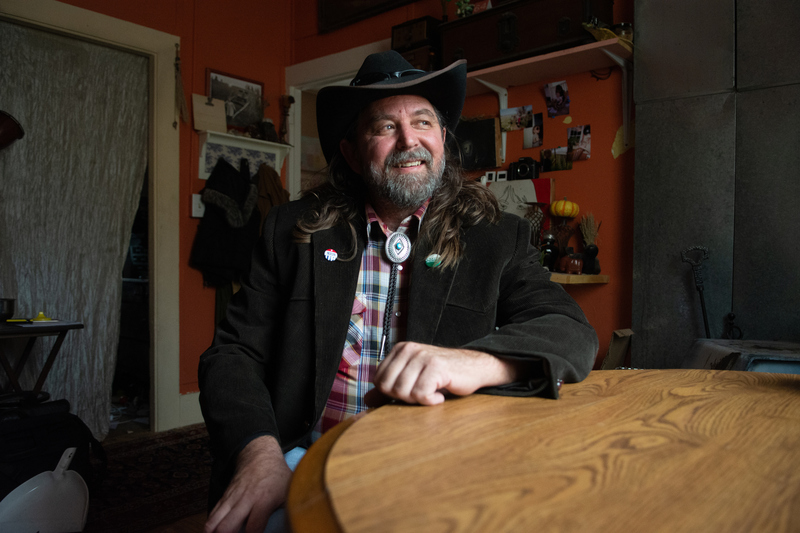 Gilman, who is also a Storey County commissioner, said a typical day is “busier than you can imagine.” He said he gets up around 5:30 a.m. because he has a two-month-old puppy (a lab). “Otherwise I’d be more like 6:00 [a.m.] and 6:30 [a.m.],” he adds. In his original defamation complaint, Gilman came at Toll with a number of claims that the Storey Teller had said things that were false. But in April, the judge dismissed all but one of eight claims against Toll under anti-SLAPP statutes, meant to prevent frivolous lawsuits. The one claim left open has to do with Gilman’s residency as a Storey County commissioner. Toll claimed that Gilman committed perjury, alleging Gilman did not live in Storey County. In a follow-up interview with The Nevada Independent, Toll said he had multiple sources to back it up. Gilman vehemently denied the claims. He said he lives on the Mustang Ranch property. “Gilman’s claims that Toll defamed him by claiming that Gilman does not live in Storey County are belied by Gilmans own claims that his primary residence is in Washoe County, and as such Gilman’s protestations do not provide any basis for restricting Toll’s free speech rights under the First Amendment,” Toll’s lawyers wrote in the motion, which was filed in late February. In response, Gilman’s team submitted his ID, concealed firearm permit, tax returns, DMV registration, banks statements, a hospital bill and receipts. All of the documents, some going back a few years, contain the address for a residence on the same street as the brothel. His lawyers noted that the term “resident” has a “specific” meaning in running for office. 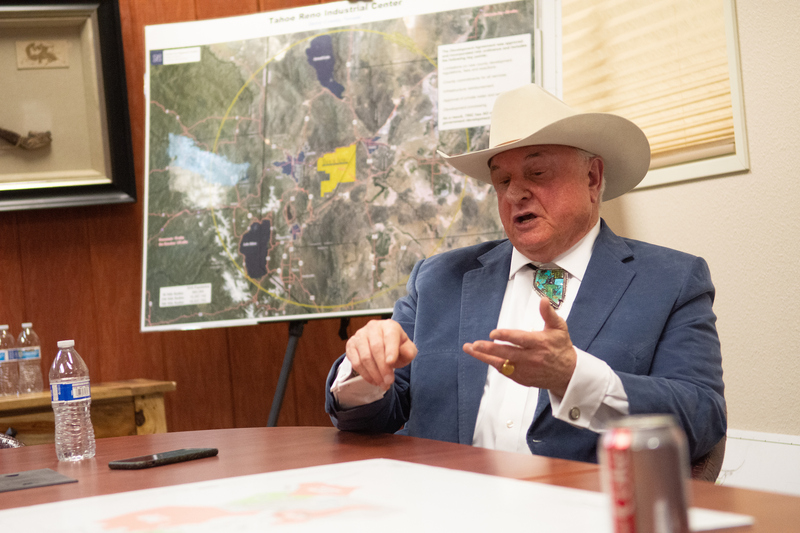 “Simply because Gilman owns another property, does not mean that property is his ‘legal domicile’ or ‘actual residence’ for purposes of his eligibility to run for office in Storey County. 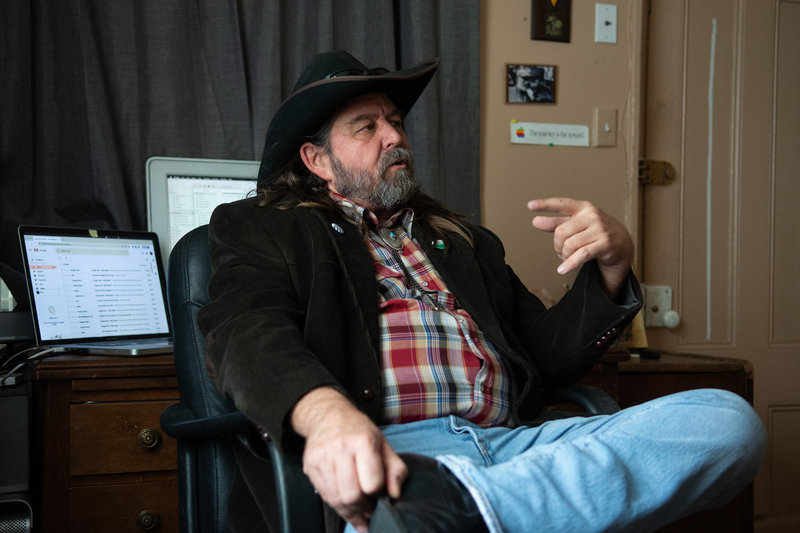 Moreover, the fact that Gilman owns another property does not erase Toll’s defamatory comment that Gilman committed perjury when he stated that he lived in Storey County,” Gilman’s lawyers wrote in an opposition to Toll’s effort to dismiss the claim. Las Vegas attorney Gus Flangas is representing Gilman. Gilman said he was limited by his lawyers as to what he could say during the interview. But he understood why some people, given his wealth, might be surprised he doesn’t live a more lavish lifestyle. As with many defendants in First Amendment cases, Toll is a complicated figure. In front of his Gold Hill cabin a campaign sign leans against the yellow wood panels. It reads “Re-Elect Storey County Sheriff Gerald Antinoro.” Antinoro is the embattled sheriff of Storey County and at the center of a #MeToo case that has made national news in recent weeks. In the same NPR story, the sheriff said Gilman was upset about how he had enforced the law when it came to his brothel business. In an interview, Gilman said he had nothing to hide. The sheriff denied the allegations to NPR and pointed to the fact that county voters re-elected him. The public sniping is well-known in Storey County. Karen Woodmansee, a former publisher of the Virginia City News and reporter for the Comstock Chronicle, said that she knew Toll’s father, who used to run the Gold Hill News out of the cabin his son now occupies (Toll proudly hangs a printing press plate from his father’s paper). “I don’t really consider him a journalist in the way I was trained,” she said. She said that Toll is “very entertaining as a person” but conceded they had tussled once over a Facebook post. She bristled at the initial basis of Toll’s blog as a way to defend the sheriff. “It’s not really your job as a journalist to defend one politician over another,” she said. Toll does not deny defending Antintoro. He said it was to counter the recall campaign. The communications director for the Libertarian Party of Nevada, Toll said he generally had a “poor” opinion of the police and found it ironic he was going to bat for the county’s top cop. “Many of the people who antagonized me as a little kid are now retiring from county service and belong to the same five families that think they own this place, and have, frankly, been in control of much of how the county operates, since I was a kid in the mid-70s,” he said. Since starting his blog, Toll has expanded it to cover county activities. He has recently reported on finalists for Storey County city manager and the recent explosion at the Delta Saloon. Toll said the website gets about 2,000 hits per week, and he is a member of the press association. “It’s not about me,” he said. “It’s about shining the light where people aren’t comfortable with it being shined, and that’s part [of being a journalist],” he said, describing where the site is now. Toll said Antinoro is changing the county’s culture. When asked about the sexual misconduct allegations, as reported by The Nevada Independent and NPR, he said there was no question that the sheriff had erred in his interactions with former deputy Melanie Keener. Toll said several other allegations against Antinoro have the “fingerprints” of his opponents. 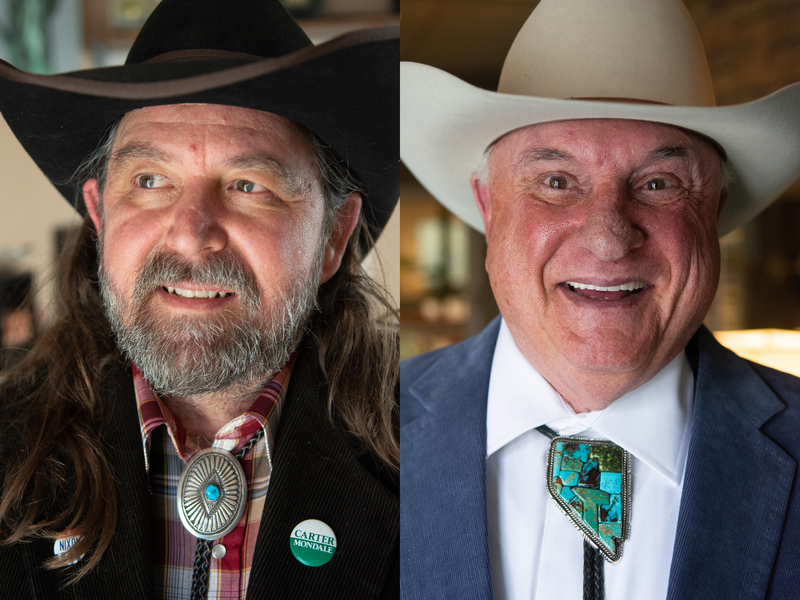 With Antinoro still in office despite the recall and sexual misconduct accusations, his opponents are pursuing another course to remove him through the state’s Commission on Ethics. If an official is found to have willfully violated three ethics laws, then they can be removed from office. The commission has found that Antinoro has violated two ethics laws in the past. Antinoro is appealing both rulings, according to NPR. A third claim, filed by Thompson, that Antinoro used his uniform and badge on campaign material, was referred to the full commission in February. Gilman and Thompson said Toll’s political activity should disqualify him from protections as a journalist under the shield law. Toll ran for school board last year, an election he lost. Toll has publicly said that he plans to run for County commission in the next cycle. 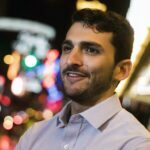 Although he does not live in Gilman’s district, he has floated the idea of renting a place to qualify for a run against him. During an hour-long interview, Gilman and Thompson argued that Toll had used his blog to further his own political ambitions. They said that their issue is not journalism on the Internet (Gilman is a donor to The Nevada Independent), but the mix of politics and journalism. “As if he’s a legitimate journalist,” Gilman added. Media experts argued that this point was irrelevant in deciding whether or not an individual is a journalist. In the 20th Century and the 21st Century, most mainstream newsrooms shunned the idea of mixing politics — even opinion — with their newsgathering operations. But reporters have blurred the two dating back to the nation’s founding and even in more contemporary Nevada politics. Sam Adams and Ben Franklin were both journalists and politicians. Lerude said there is no law that prevents a journalist from being a politician. He described journalist as a vocation, or a trade, that can be practiced in tandem with other work. Lerude said he was not advocating that it was right for a journalist to go into politics and cover politics at the same time. He never would have let one of his reporters do it because it would be a conflict of interest. But he said nothing in the law would prohibit it and cited many precedents. In fact, former State Sen. Warren “Snowy” Monroe, who wrote the shield law, was also a publisher of The Elko Independent. 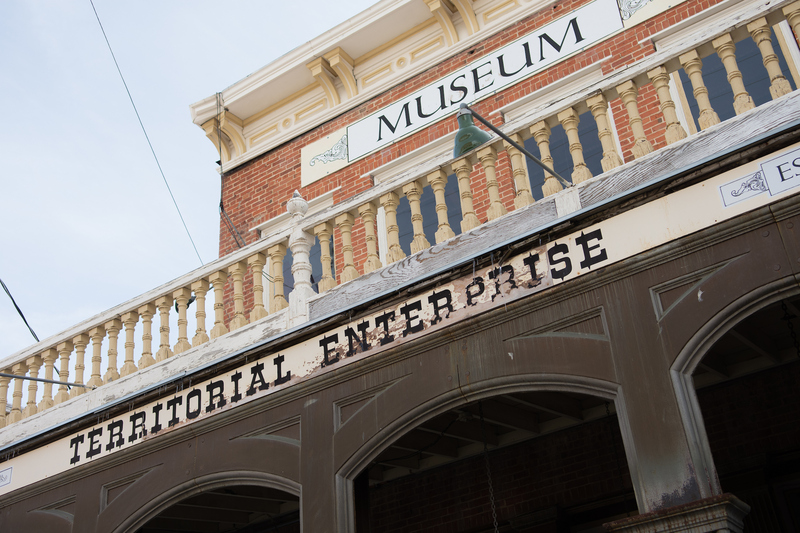 There are other instances of editors and publishers for papers, like The Elko Daily Free Press and Mason Valley Times, having political positions. The courts might soon have to contend with the question Gilman raises. With the Internet and social media, the lines between journalism and politics have blurred more and more, and it is likely to become a subject of increasing legal battles. In Nevada during the 2018 election cycle, former Sen. Dean Heller set up a website designed to look like a news source, as did supporters of the ballot measure aimed at creating a competitive energy market. But in Toll’s case, the court and media experts have said that he is a reporter. “Libel is an issue that keeps bubbling up,” File said. Gilman said he is not trying to abridge the rights of reporters. It is unclear how the lawsuit will end. Toll’s lawyer plans to ask the Supreme Court to weigh in on the District Court’s shield law ruling, even as the lower court case is ongoing. It is also possible the District Court could rule on other issues that render the shield law issue moot. The judge could do that by ruling on Toll’s motion to dismiss and throwing out the final defamation claim. Either way, Gilman does not appear to be giving up any time soon. “This case has the opportunity of going to the highest court in the land,” Gilman said. Update at 8:10 a.m. on 3/17/19: This story was corrected to reference the legislative history compiled in a 2014 master’s thesis, not a doctoral thesis as was incorrectly stated in the original story.